We had been having a lot of hot and sunny weather this summer in London and I’ve found that I’m happiest and most comfortable wearing shorts in such weather. So since I’d been admiring the Sewaholic Thurlow trousers/shorts pattern for a while it seemed time to take the plunge and make my own shorts! This pattern has a couple of key new sewing features that I was keen to learn (welt pockets and a fly zip front) and I really like the style of these trousers – I cannot imagine making shorts or trousers that don’t have good functioning pockets – so was excited at the prospect of making many different versions once I had the basic fit right. Getting the fit right proved a lot more challenging than I expected! I of course started out making up a toile (muslin). This looked pretty good from the front straight away, but the back was all kinds of wrong. Around the seat it looked like my bum was eating the trousers, but just above I had excess fabric causing an unsightly bulge. I referred to LOTS of online resources on trouser fitting (Lladybird’s Thurlow sewalong is a great starting point for this) but was left feeling rather confused as the fabric eating seemed to imply I needed a longer centre back seam, but did the excess fabric higher up imply a shorter centre back seam was needed??? To cut a long story short, four toiles, copious notes and plenty of help from the fitting lesson of Craftsy class “One pattern, many looks: pants” later I was finally getting towards a pattern that fit. The key adjustments I needed to make seemed to be full seat and dropped seat (this is how Kathy describes them in the Craftsy class) but I also took in the centre back seam a lot (I think this was probably due to starting out with too big a size) which then meant adjusting the side seams on all relevant pattern pieces to get the balance back. This might sound like a lot of effort for a pair of shorts, but during this process, I came across a few articles on the topic of learning which felt very relevant. It seems that many of us as adults can be prone to giving up on learning something because we feel stupid for making mistakes, it is getting too hard or we just get really frustrated. I particularly liked this post by Tara Mohr on Giving yourself permission to learn: “I’d forgotten — or maybe never fully realized — how much effort and failure is involved in learning anything“. Being conscious of this, I gave myself breaks when I needed them and was determined not to give up. When I finally had a toile that was looking decent I found myself putting it on a few times just to check that I hadn’t dreamed it! Since I was making quite a lot of changes to the pattern pieces, I made up a fifth toile and this time included most of the details for some practice. Funnily enough my first welt pocket looks better than the second – my attempt to streamline clearly didn’t work so well. It took me three goes to get the fly zip installation correctly aligned so I’m very glad I practiced that and I’m now finally ready to make up a proper pair – just as the weather is turning and starting to feel like autumn! While I may not get much more chance to wear shorts this year, I have a few ideas for trousers I’d like to make so shouldn’t have to wait until next summer to feel the benefit of all this hard work. Wow Alex! That is some committed toile-ing going on there! 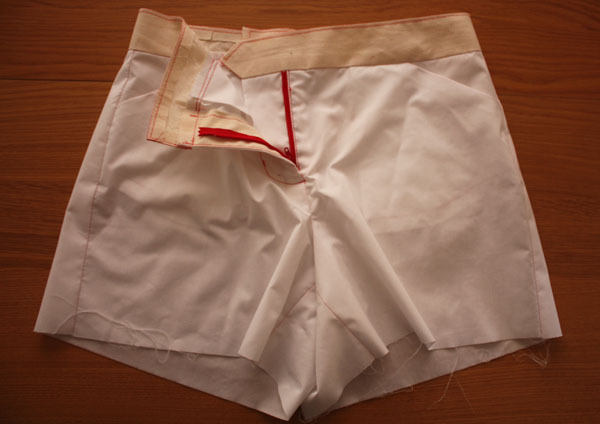 You can make those shorts with full knowledge that you have nailed the fit. 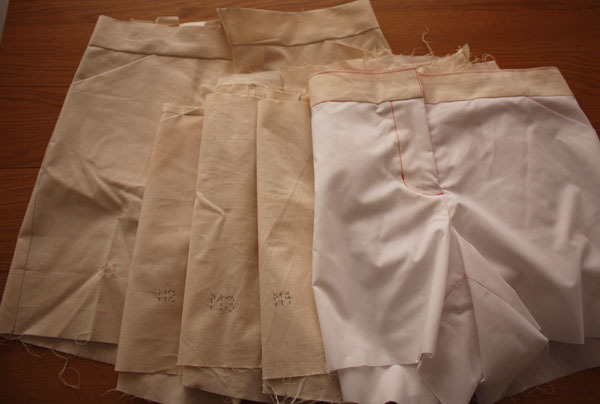 What fabric and colour are your first shorts going to be? I am looking forward to being able to spend some time sewing without my dissertation / house renovation gremlin on my shoulder shouting all sorts of terrible things at me!! Maybe it’s in my head but I’m certain I’ve actually seen a gremlin lurking around my house…. 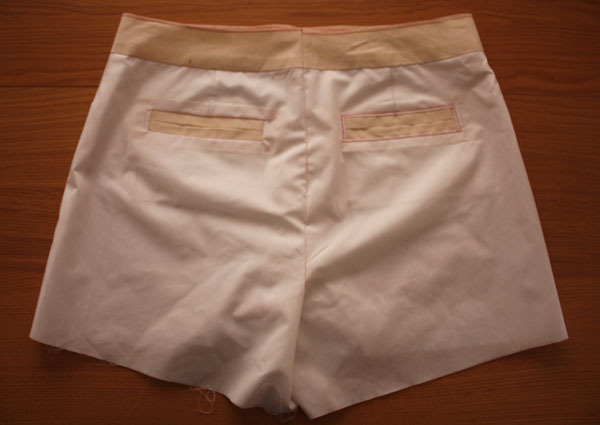 My first pair of shorts are a kind of cream colour, the fabric comes from an unused curtain so there’s no pressure if they are not quite right! Even with all these toiles, I still feel like I want to wear the shorts for a bit to suss out any further fit improvements before I cut into some new fabric, and think there is going to be a bit of trial and error to figure out what’s the best type of fabric for these. Lladybird has lots of lovely versions of Thurlows! Her sew along has been a big help in getting to grips with these and I plan to copy her adaptation for slim leg trousers at some point.